I spent today at school, at a women's health training session, put on by a group of students (mostly second-years) who are starting a new student-run clinic to serve the local population of homeless women. The clinic will open in October, and this training was mostly for students who hope to be able to volunteer there, and also for students who are just interested in women's health issues. Despite being the large part of a Saturday, it was by far one of the best days I have had here so far. (Interesting that it was not part of the curriculum, nor was it put on in any way by the faculty...) The schedule was packed and fast-moving... we did not have nearly enough time for all the things they had arranged for us to learn. We got to learn pelvic exams, speculum and bi-manual, on simulator models (which are just plastic dummies from the waist down and the mid-thigh up... pretty funny-looking), we learned about STIs and how to identify them by symptom and microscopy, we learned about urinalysis tests and how to read the dipsticks, we talked about how to take a sensitive sexual history and how to identify women with risk factors for abusive relationships, we talked about all the different contraceptive options and why each would be good for different patients, and a few other topics. It was all so interesting and fun. But the best part of the day, for me anyway, was learning how to do a sonogram. 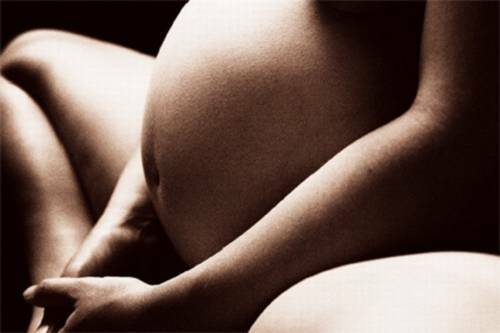 There are three pregnant second-year students who volunteered to come in and let us learn on them. One was 13 weeks along, one was 33 weeks and one was 36 weeks. We had an ER doc and a radiologist helping teach us how to hold the wands correctly and how to orient ourselves to the images onscreen. It was SO amazing... I got to practice doing a sonogram on the 13 wk and the 33 wk, and I was able to find the heartbeat on both of them. 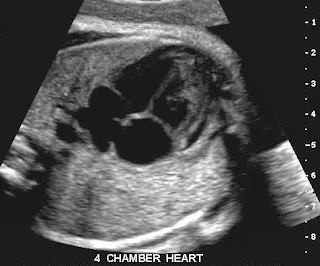 The tiny one was just a barely visible little flutter on the screen, right in the middle of the small shape that is starting to vaguely resemble a baby, and in the bigger one, you could actually make out all four chambers of the heart, like in the picture below.